Biography This kind body builder loves muscles and lilies. Why lilies? They symbolize purity. Heart Quote Look at this buffness! I'm huge! How'd you like to be my punching bag, weakling? 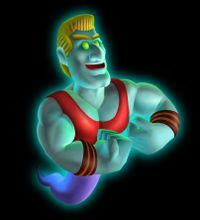 Biff Atlas, the Bodybuilder (Japanese: マッディー Maddī), is one of the many ghosts featured in Luigi's Mansion. His first name is a pun on "biff", which is slang meaning "to hit". His last name is based on Atlas, a titan from Greek Mythology who was forced to hold up the Sky. His portrait number in Professor E. Gadd's gallery is 16. When Luigi enters the Rec Room, Biff is focused on lifting a barbell, and does not attack Luigi. Luigi can either choose to provoke Biff to attack him, or just ignore Biff entirely, as Biff is one of the five optional gallery ghosts in Luigi's Mansion. In order to provoke Biff, Luigi must smack one of the three nearby punching bags while avoiding its backswing, which can injure him. If aimed correctly, it hits Biff and causes him to attack Luigi by swinging his fists in a rage. One of Biff's punches causes Luigi to lose twenty HP. Luigi has to pound Biff two more times with a punching bag in order to expose Biff's heart. Before the third hit, Biff gets even angrier and starts whirling his arms. After his heart is exposed, Biff becomes vulnerable to the Poltergust 3000. If Luigi fails to catch him, Biff returns to weightlifting and Luigi must hit him with another punching bag to resume capturing him. Biff has turquoise skin with a blond flattop and green eyes. His head is rectangular, his chin has a small cleft, and his body is well-muscled. He wears a red sleeveless muscle shirt with red wristbands, a brown belt with a gold buckle, and magenta shorts that fit around his tail. A bust of Biff Atlas can be found in the The Artist's Studio. Most of the time Biff Atlas is shown to be having a hard time lifting the barbell. If Luigi continues to leave him alone, he will eventually succeed in lifting it after a few attempts. In his platinum frame in the remake, the background heavily features lilies, referencing his stated fondness for them. This page was last edited on January 28, 2019, at 20:07.